I attended a 60th birthday gathering for my friend Chuck last Wednesday. As I was just getting ready to head out for another commitment (my second of 3 appointments that evening), he made the comment, “One of these days I’m going to put Velcro on your chair so you’re forced to stick around longer than an hour.” Ha – sounds about right! It was a double-duty mileage weekend out here in the American Southwest. My Legend coupe and my ILX both saw some highway use on a trip out to Southern California for sunshine and relaxation. 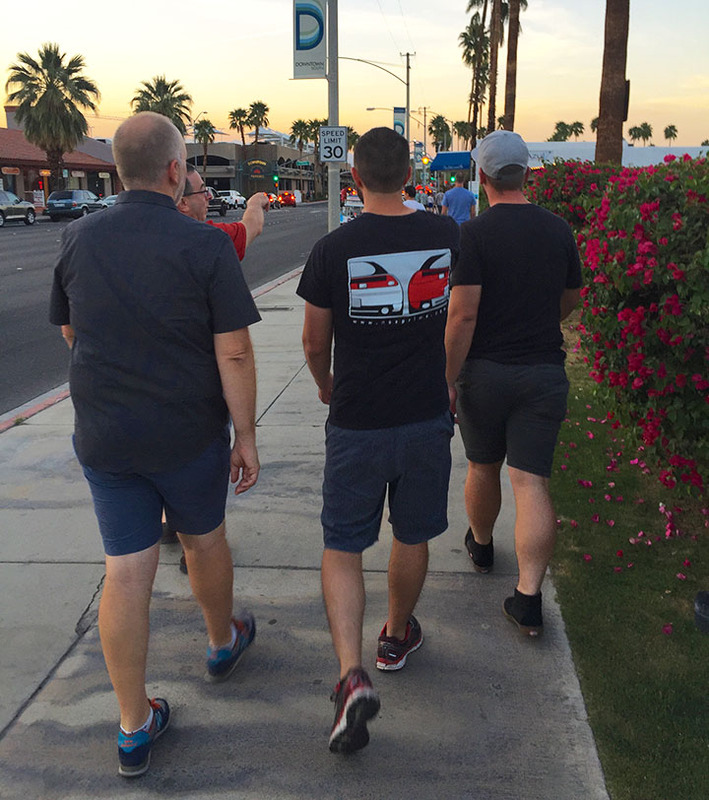 Since the early 1900s, the desert city of Palm Springs has blossomed and grown as a destination for its hot springs, architecture, and tourism in the surrounding landscape. I’ve visited many times over the last few years and it’s an easy 4-hour drive door-to-door from my place in Scottsdale, Arizona. Ever the king of multi-tasking, I had to stop twice at gas stations and respond to some work emails. 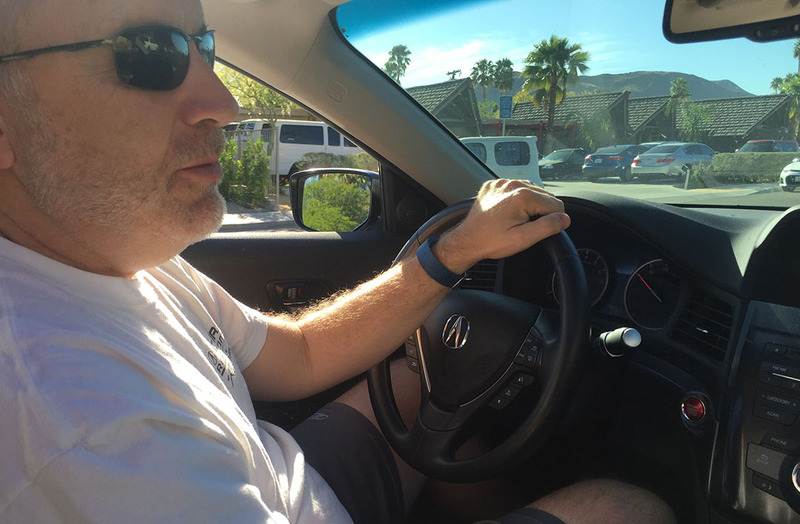 I was in my 1994 Legend LS since my friend, Justin, would be heading out later on in the evening in my 2013 ILX. The drive into the sunset was enjoyable and I made really good time. 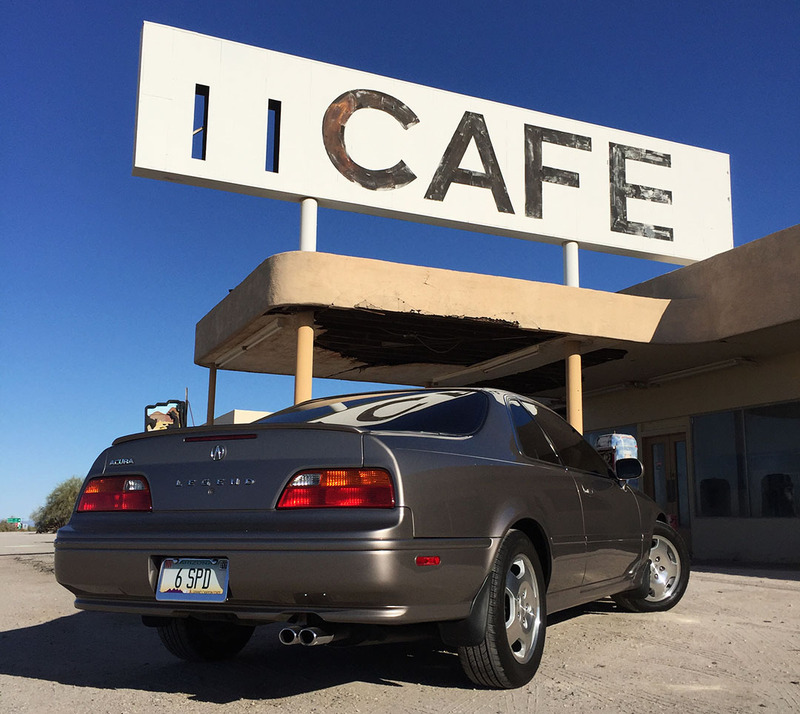 Even at over 540,000 miles, the Legend is still a great highway cruiser than revs at fewer than 2,500 RPM at 80 miles per hour. 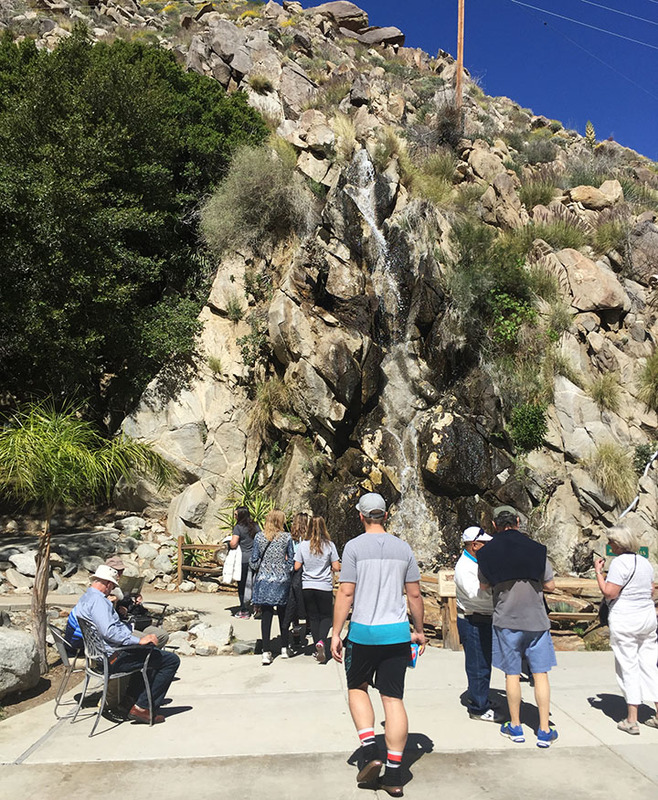 One of the attractions I’d been wanting to see in Palm Springs for a very long time is the “Aerial Tramway,” a 2.5 mile, 10-minute ride that climbs in a cable car from 2,600 feet to 8,500 feet in elevation. 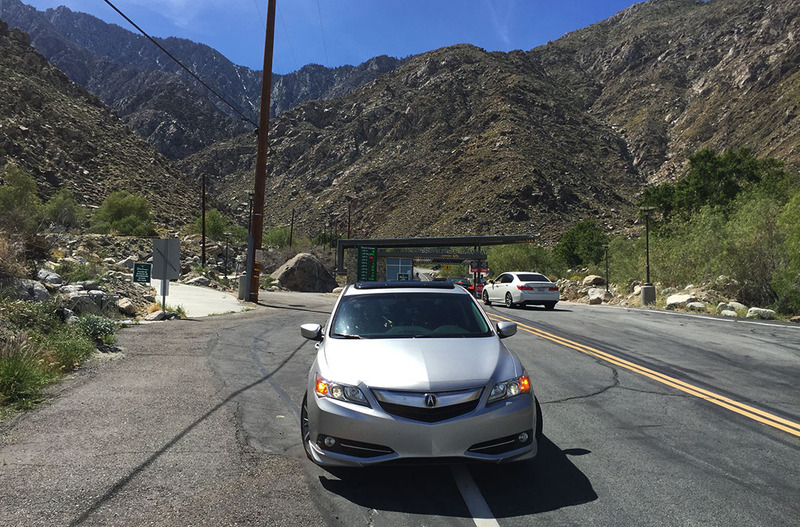 It opened in 1963 and climbs in elevation through a rugged canyon to the top of San Jacinto Peak. Justin and I headed to the tramway station on Friday morning and the wait time was about an hour until the next available departure at 12:40 p.m. The ascent wasn’t without some drama. I have both a moderate fear of heights and a slight degree of motion sickness, so after lift-off when the interior of the 80-passenger car started spinning around, it took me a minute before I could even feel comfortable opening my eyes to look outside. I remember being very grateful that there were a few windows open to let a breeze through so I could get some fresh mountain air. For the $25/adult price of admission I felt like I got my money’s worth! The view from the Mountain Station at the top was spectacular (and weather quite a bit cooler than where we’d started). There are quite a few amenities including a restaurant and snack bar. We indulged in a $5 tray of nachos and some potato wedges before getting ready to hop on the next available car and make our descent. 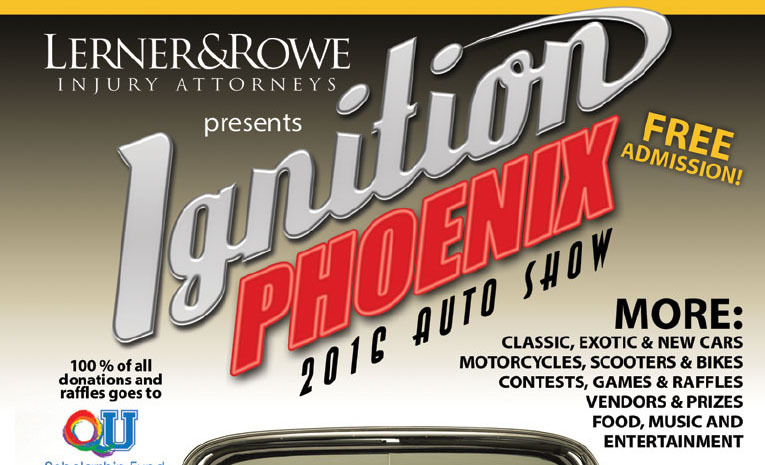 I got back from Palm Springs just in time for a car swap at home, then headed to the 2nd annual “Ignition” car show at the Arizona Fairgrounds in central Phoenix. 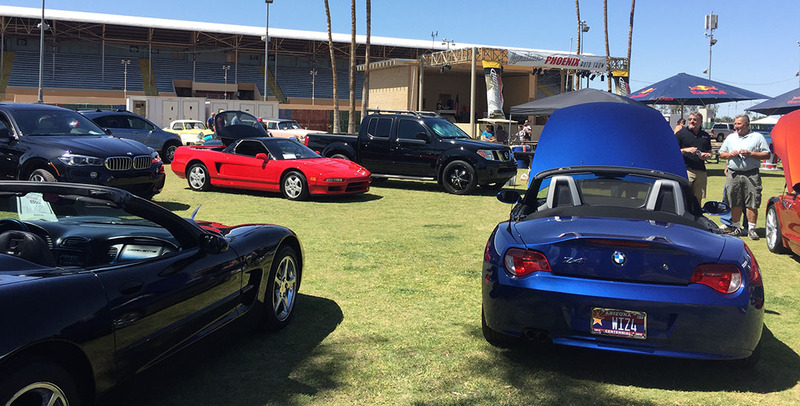 There were probably 50 vehicles in attendance, spanning a wide range of types. 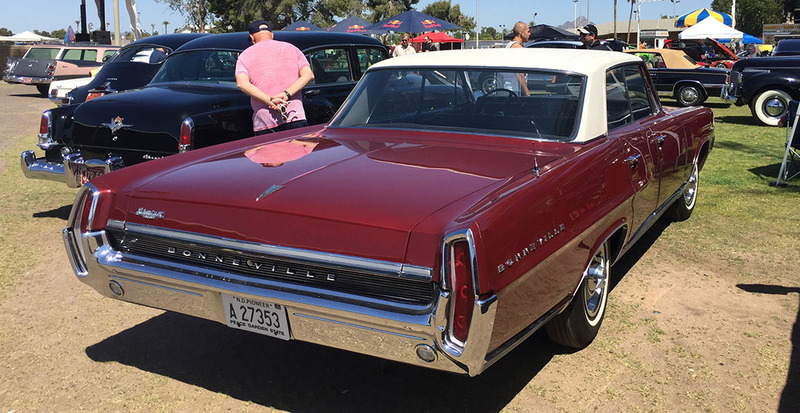 The centerpiece was a 1960 Bentley, but at the other end of the spectrum was a $600 Chrysler LeBaron convertible (think “Planes, Trains, & Automobiles” movie car). 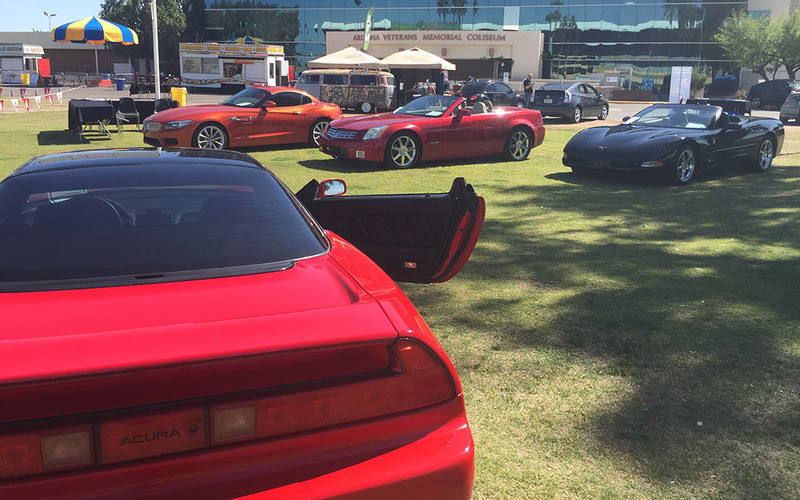 I represented with the only Acura, displaying my 1992 NSX. Midway through the day, I was asked to say a few words about the car over the loudspeaker and the master of ceremonies commented on the signature on my glove compartment, which belongs to RealTime Racing driver Peter Cunningham. Another highlight of the weekend was taking delivery of a new car for my mom. At the same birthday party referenced in my opening paragraph, I happened to be seated next to someone named John who I was meeting for the first time. 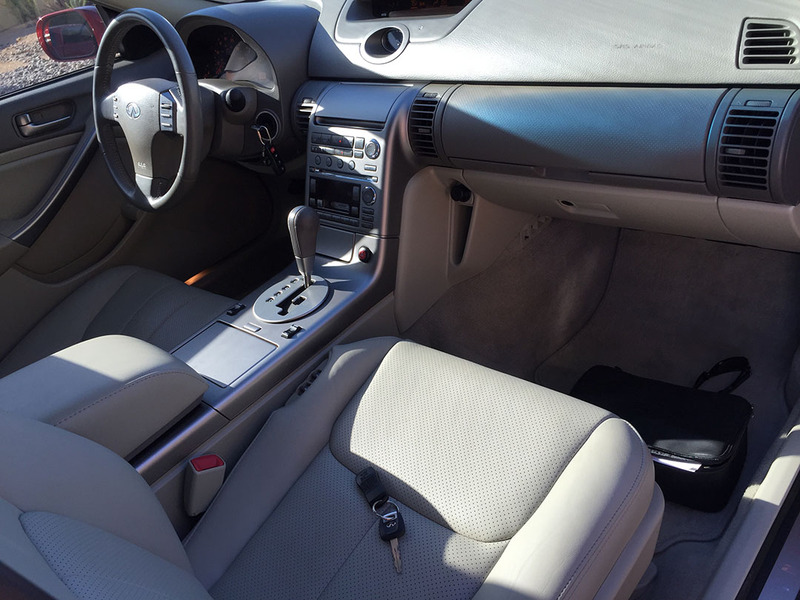 John and I got engaged in “car talk” and I came to find out that he had just listed for sale his 2004 Infiniti G35 online. What blew me away was the odometer reading: 20,192 miles. On a 12-year-old car! So my interest was piqued and I relayed the information to my mother who happened to be looking for a (larger, car-seat-friendly) replacement for her 2010 Volkswagen Eos convertible. Over the next 24 hours, she struck a deal with John and on Sunday, I showed up to take delivery of the vehicle on her behalf. 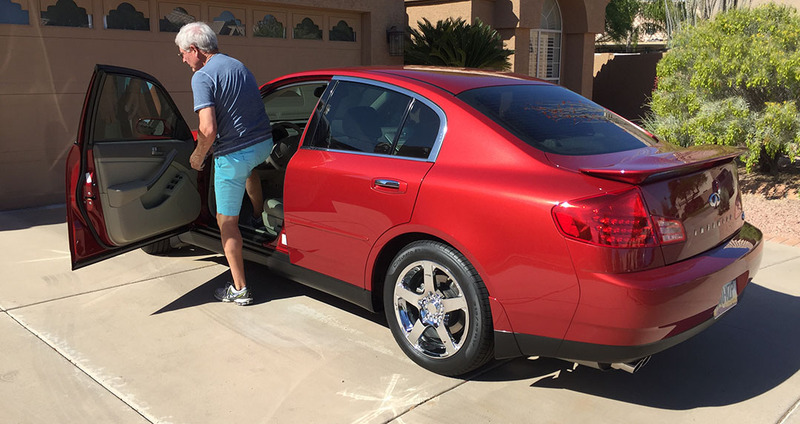 When John drove the car off the lot with 36 miles on the odometer on March 20, 2004, it right away became his special occasion car. 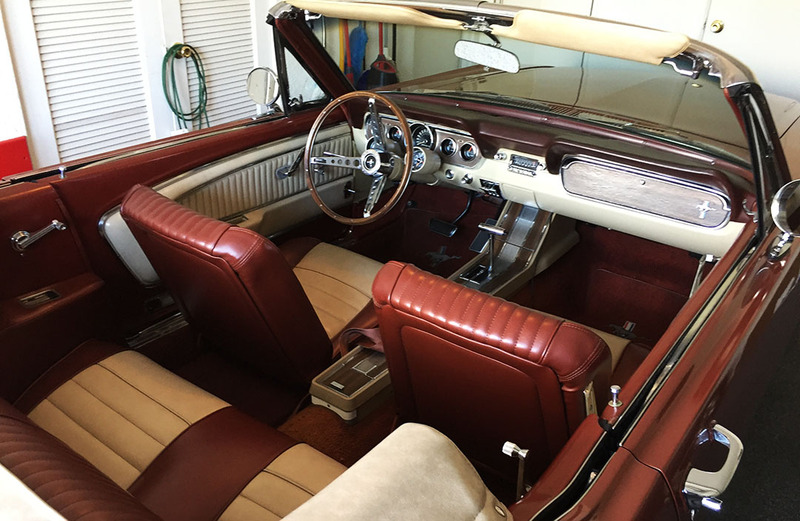 Neighbors would say, “You must have a date,” each time it would leave the garage. (His daily driver was a white Chevy S-10 pickup). Over the last 12 years, he paid close attention to detail and maintenance, changing the oil and fluids himself. 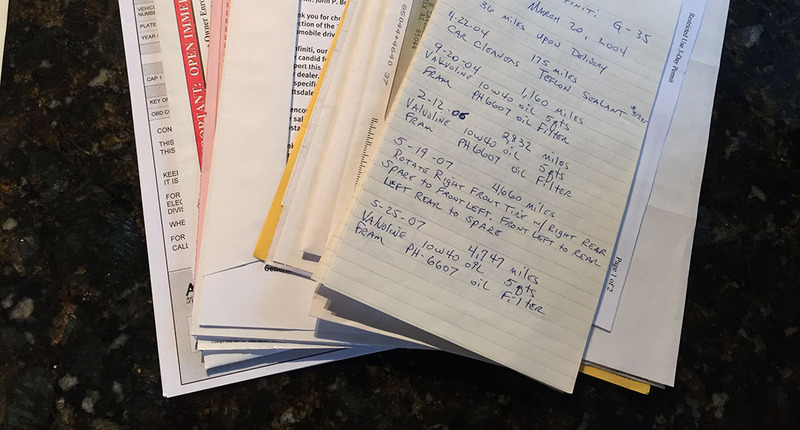 He has kept detailed notes on everything done to the car, and during our transaction he walked me through all the paperwork. Most used cars don’t even come with an original window sticker. 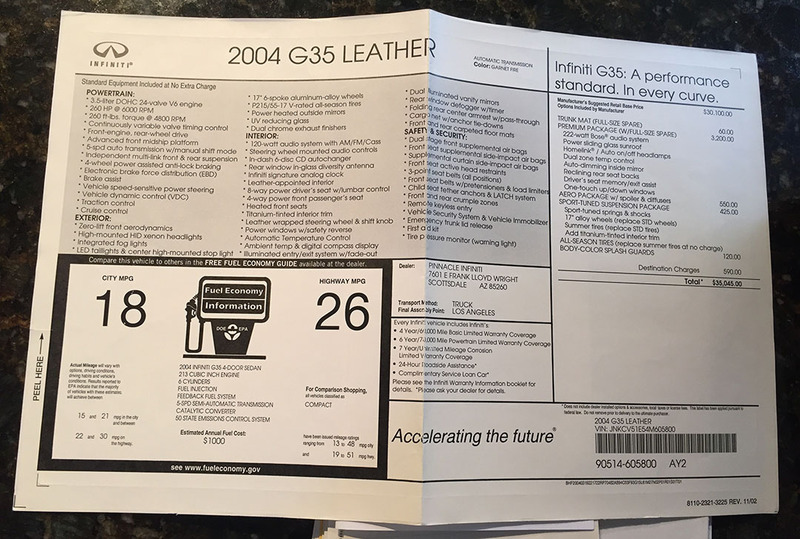 This one not only came with that, but also with full books & records, a 4-page handwritten maintenance log, even a printed page from Infiniti.com from when John “built” his car online before taking delivery. The car has found a good home and now resides in my garage for 2 weeks until mom flies down to get it. Here are the rest of the pics from this action-packed last few days! 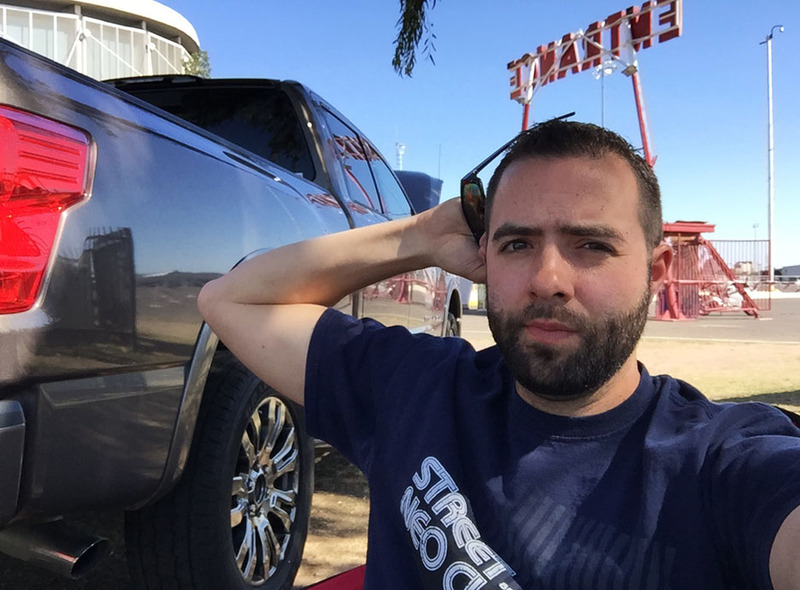 This entry was posted on March 28, 2016 at 4:49 pm and is filed under California, ILX, Legend, NSX, Road Trip. You can follow any responses to this entry through the RSS 2.0 feed. You can leave a response, or trackback from your own site. That G35 is so clean! Looks cleaner than most new ones do. Tyson, did your ILX get recalled for the airbags too? Thanks! Yeah I think the G was a good find. I did receive a recall notice about the ILX but it said that parts are not yet available so there is no action required at this time. my local dealer gave me a loaner, I’m sure yours would too! if you were interested i mean. I hear you about the tramway. I was visiting New Mexico with my mom some years ago and she (who is not afraid of heights) convinced me (who is afraid of heights) to do the tramway up the Sandia Mountains in New Mexico. Beautiful view. But never again. Haha, glad you can relate! It wouldn’t have been so bad if it hadn’t been spinning within the outer car shell. But the elevation, with the spinning, with the jolt every time the car went across one of the towers, left me a little uneasy! The Sandia Mountains in NM are beautiful. I need to get out there. I’m anxious to be introduced to my new ride. Lots of memories are in store. I can’t decide if it is a he or a she, therefore I don’t know what to name it. I love the paint color and the body Tsaile. Thank you for letting me in on this meant-to-be transaction. How did style turn into Tsaile? Gee whiz. See you 2 weeks from tomorrow! Sounds like an exciting weekend and that’s a beautiful G35! I hope your mom enjoys it! Thanks Brendan! I’m pretty sure she will. We are currently researching the best way to configure some SiriusXM connectivity for her in there. I keep forgetting it’s a 12-year-old car so not exactly the pinnacle of current technology! Hope your week is going well. Mama Tia is one lucky lady to soon be the owner of the G35. it doesn’t wear an “A” on its grille, but I think it will be a fine ride to haul her and the grandkids around for a few years! Thanks Kevin! I am really looking forward to developing a relationship with my new car, Kevin! Very nice! Keep racking em up. Come visit me in AZ! 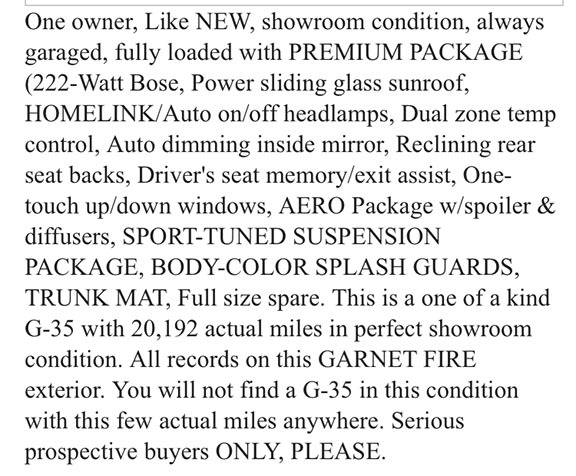 Leave it to you to find your mom an ’04 G35 that looks like it just rolled off the line. Love that color too! The color is so eye-catching. It makes me really feel “blah” about my Silver Moon ILX, and my Desert Mist Legends. Talk about a yawn! Anyway thanks for the congrats on the find. Sounds like mom has a buyer on the line for her 2010 EOS so the transactions are coming together smoothly. Hope your week is going well, Brad! Glad we got to see you this weekend. Your mom’s G35 is really something special! Great find! I was kinda shocked by them putting my name in there! I have to show up now 😉 ! Glad to stand in for you and hope you can make it to Touge next year! It really does! I love the low-end torque. 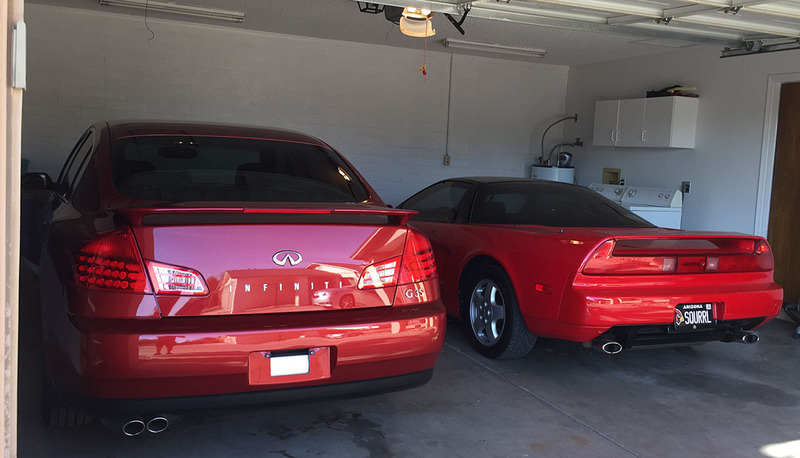 It only has 10 fewer horsies than my NSX, and 30 more than the Legends. Best of all, the rear-wheel-drive is a whole different driving experience. Handling is sporty and fun. I think she’ll dig it. Thanks for reading! 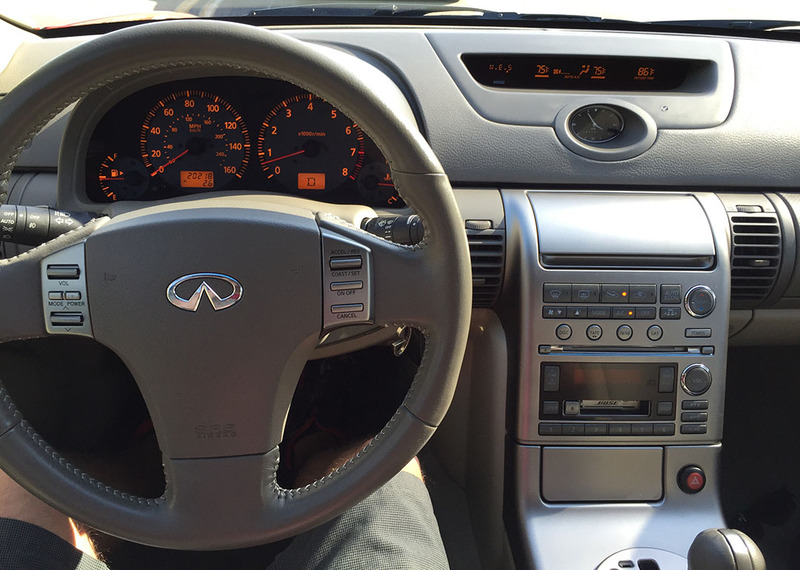 OK even I had to log in and offer my thoughts on just how insanely gorgeous that G35 sedan is! Momma Tyson should be very proud to own that! It amazes me whenever anyone buys something as beautiful and luxurious as that G35, and then has the discipline to drive it so few miles. Incredible. Hey Tyson, it’s Uri! (with the ’13 Civic SI – formerly). 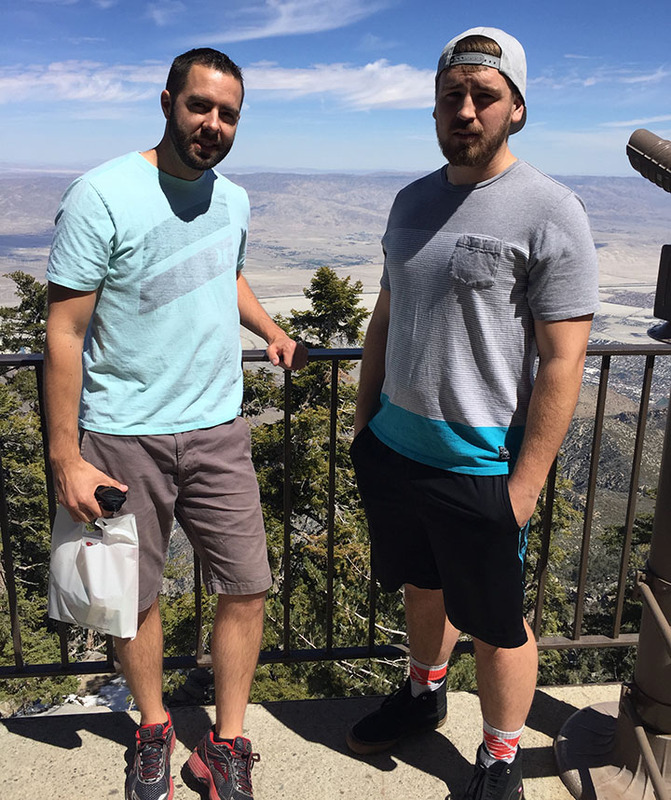 As a native of LA, I actually went on that Palm Springs tramway a dozen or so times already, often backpacking up on Mt. Jacinto. 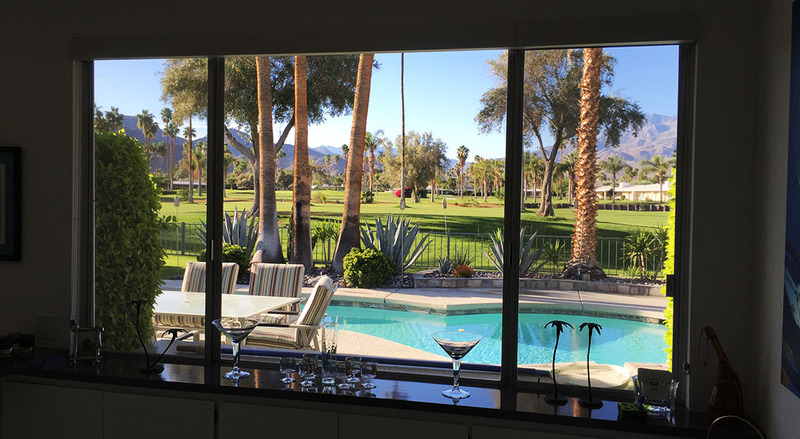 It was always a serene respite from the heat of LA and Palm Springs. Whenever I was having a particularly stressful week of work in LA, I’d ride out there, ride the tramway up, and just hike around listening to music on a portable CD player (think 2002 or so). If you can stand the height and motion again, I can highly recommend that. PS – my goodness do I miss the south west corner of the US. Hey Uri, it’s great to hear from you again! I was wondering what you had been up to. 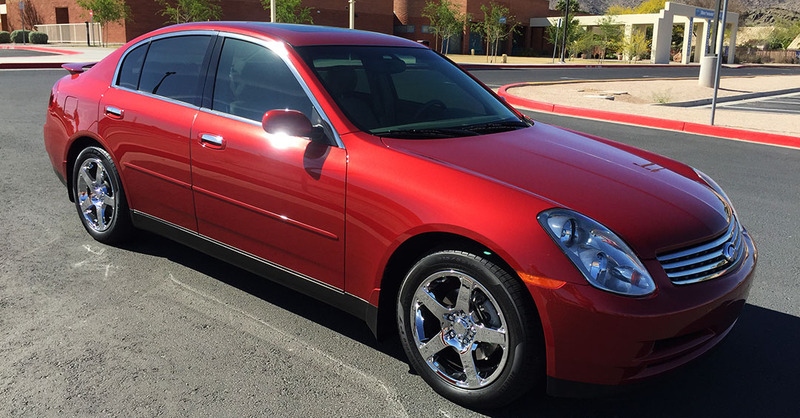 Agreed my mom got a nice car with that G35. She’s flying down on Wednesday to pick it up, but I’ve enjoyed looking at it in the garage for a bit now. The next time I get out to the LA/PS area I will definitely try and set aside some time for hiking at Mt Jacinto. How have things been going for you? I was actually laid off a couple months ago, so have been constantly and continuously looking for work and such. The ironic thing is, I’ve been dying to drive cross-country in the Miata and see the south west again, since I have the time, but I’d feel super guilty spending any money on that, when I should be networking for jobs. Such is life I suppose! I actually emailed you a few months ago about the Miata but never heard back, so I figured I was black-listed for buying a Mazda and not an Acura. 🙂 For what it’s worth, I’d still very much love to own a TLX, but when they’re affordable enough for me as a 2nd vehicle. Hey I don’t remember getting your Miata email. Can you send it again? Sorry for never responding! Sometimes my Yahoo mail sends things to Spam folder that it shouldn’t.